It was early February... the weather was hot and humid. "what shall we have this weekend?" I popped my usual question to H.
"Its been a while since we ate this..."
Though it was a lengthy and tedious preparation...in Chinese words ~ 'mah fan' or Malay word ~ 'renyah'...with chicken pieces require overnight preparation (marinate)... prepare, wrap and deep fried wontons... then on to preparing noodles. But the end results was ... a plate (or 2...ooops) of delicious, satisfying meal. I thank you for your support towards FMLK: reading my rantings and taking time to type your words of wisdom in my comment box below. 1/2 carrot - diced . Wonton skin from Asian Grocer..
Marinate the boneless chicken thigh in the refrigerator overnight. Note : Take out the marinated chicken an hour before cooking. Arrange the chicken in a single layer on the roasting grill, and roast for 30 minutes or until the chicken is fully cooked. Saute the thinly sliced shallots until it turn golden/ brown. Using a slotted spoon, dish the onion out onto an absorbent kitchen paper. Fill up the wonton skin with 1 teaspoon of the mix. seal up the edges with the cornflour mixture (act as a sealer), and shape into an 'old Chinese gold coin'. Place the noodle in the heatproof container. Rinse with cold water to stop the noodle turning moosh. Place the noodle in a bowl. Divide the noodles into plates. Arrange the wonton and baby bok choy by the side. Top with sliced char siew chicken strips. Sprinkle the golden fried shallots. A wonderful recipe! I love noodles, bok choi and wontons, so I'm sure I'd appreciate this dish. Congratulations, Lisa! That was quite a big improvement and achievement! Congratulations Lisa for being in the 16! A good pat on your shoulder! You must be very pleased and keep up your good work as I am always looking forward to your post. No matter how mar fan any recipes now, I know you will go ahead to cook/post for 'us' ! Can I have one plate wonton noodles but please drizzle more sauce in for me please? Congratulations, Lisa!!!!! Proud of you!!!! These wonton noodles are asking to be eaten right off the computer screen! Congratulations on making it to the top of the list! You deserve it! 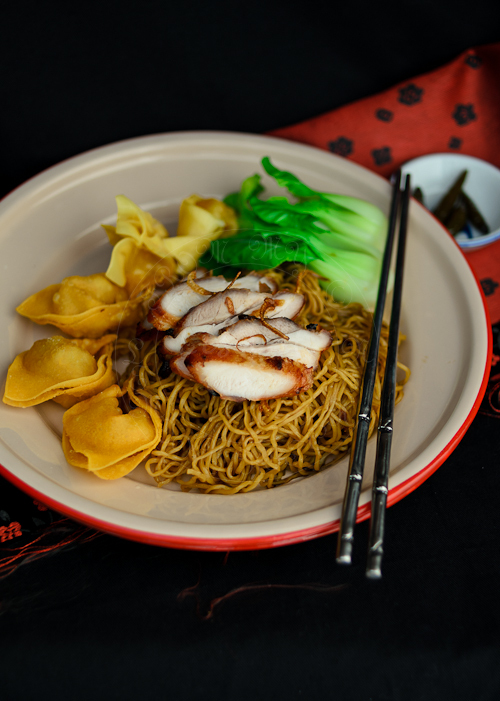 Love wanton tp malas lah nak buat. I love chili wanton so I adding some chili slice to make it look great. This is good for taking lunch. Anyway how to make the bok coy keep fresh like that? I love the color. Bok Choy, I microwave (my m/wave has a button to steam vegetables) then immediately toss in Cold ice water. Congrats again Lisa!! I love your blog and I'm so proud of you! :) Beautiful and delicious wonton noodles shot.